Exhibiting a wealth of interesting activities and novel structures, Boswellic acid and the other terpenoids of the genus Boswellia (from which frankincense is derived) are a growing source of interest for the natural product drug discovery community. 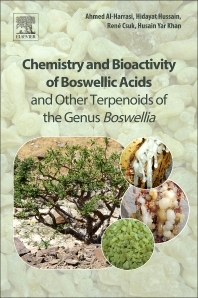 Chemistry and Bioactivity of Boswellic Acids and Other Terpenoids of the Genus Boswellia presents, in a single volume for the first time, key research into their structures, synthesis and potential as starting points for the development of medicinal agents. Drawing on the authors’ expert knowledge, this volume is an interesting insight into the identification of novel compounds from endemic plant sources, and is a useful tool for all researchers involved in the discovery and development of bioactive structures from natural products. Prof. Ahmed Al-Harrasi received his BSc in Chemistry from Sultan Qaboos University in Oman in 1997. Then he moved to the Free University of Berlin from which he obtained his MSc in Chemistry in 2002 and then his PhD in Organic Chemistry in 2005 as a DAAD-fellow under the supervision of Prof. Hans-Ulrich Reissig. His PhD work was on New Transformations of Enantiopure 1,2-oxazines. He then received the Fulbright award in 2008 for postdoctoral research in chemistry, for which he joined Prof. Tadhg Begely at Cornell University to work on the synthesis of isotopically-labeled thiamin pyrophosphate. After a postdoctoral research stay at Cornell University in 2009, he started his independent research at the University of Nizwa in Oman, where he founded the chair of Oman’s Medicinal Plants and Marine Natural Products, merging chemistry and biological research. Dr. Al-Harrasi is currently a professor of organic chemistry and the Vice Chancellor for Graduate Studies, Research and External Relations at the University of Nizwa. He was a chair and invited speaker in many international conferences, and is a reviewer for more than 15 international chemistry and biotechnology journals. He has authored and co-authored over 290 scientific papers and six book chapters, and taught many chemistry courses both at MSc and BSc levels.